The Talon 60 is well suited for SMALL SCALE OR AEROBATIC HELIS ranging from 360-450 size requiring up to 1400 watts on 6S. This ESC offers Castle’s industry-leading helicopter functions, such as the remarkable direct entry governor mode. Simply type in the desired RPM using a Castle Link USB adapter (redeemable coupon enclosed with purchase) and the free Castle Link Programming Suite running on a Windows ™ PC. The compact layout and slim profile of the Talon 60 is also perfect for SCALE, SPORT and AEROBATIC PLANES in the .32 - .60 range requiring up to 1400 watts on 6S. Mounting the Talon 60 is simple and stress-free in any setup. 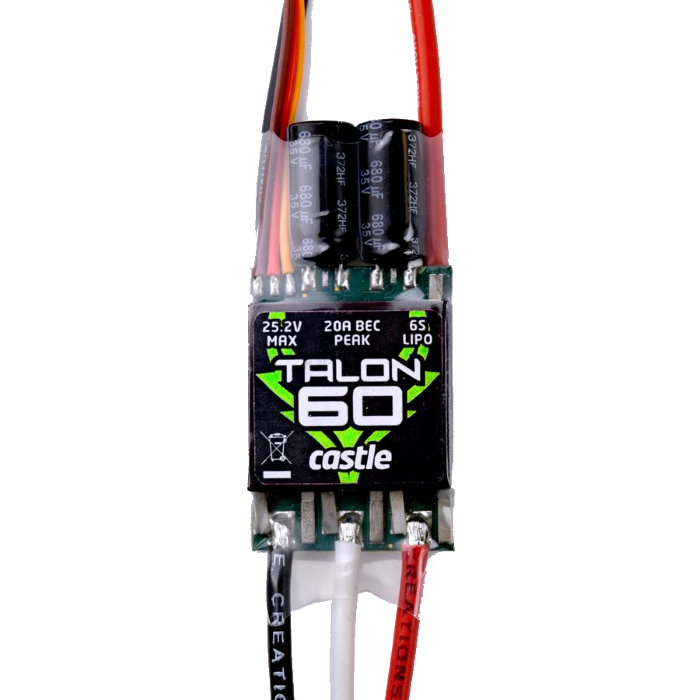 The Talon series ESCs are known for sporting heavy-duty BEC’s designed for today’s servos. The Talon 60 is no exception. With its 20 AMP PEAK POWER and 8 AMPS OF CONTINUOUS POWER, it will keep even the most draining servos at ease. BEC Voltage: User selectable choice of 6 or 8 volt output (default is 6V). Items Needed for Operation: Battery and Motor connectors sold separately. Application Guidelines: SMALL SCALE OR AEROBATIC HELIS ranging from 360-450 sizerequiring up to 1400 watts on 6S and SCALE, SPORT and AEROBATIC PLANES in the .32 -. 60 range requiring up to 1400 watts on 6S.